READY FOR SEA. The Empress of Britain provides a splendid example of the powerful appearance of the modern transatlantic liner. With an overall length of 760 ft 6-in, a moulded breadth of 97 ft 6-in, and a load draught of 32 feet, the ship has a gross tonnage of 42,348. Her normal speed is 24½ knots, and the total number of persons she can carry is 1,909. THE flagship of the Canadian Pacific’s Atlantic fleet, the Empress of Britain, was built by John Brown and Company, and launched by H.R.H. the Prince of Wales on June 11, 1930. Viewed from the waterside, the huge ship presents a wonderful picture, reminiscent of a great walled city, gleaming white and surmounted by the triple towers of her giant funnels and by the two steel masts which lift gracefully skywards. For speed and safety, comfort of accommodation and excellence of technical equipment the Empress of Britain is a wonderful testimony to the skill of the British shipbuilder. Her building, launching and fitting out can be but briefly touched on here, since the methods employed in the great shipyards are described elsewhere in this work. The ship has been built to conform to the requirements of Lloyd’s Register of Shipping under that society’s highest class - + 100 A 1. There are ten decks, one of the most important being the promenade deck, 648 feet long. Above the promenade deck is the boat deck, 396 feet long at the sides of the ship; above this is the sports deck, 455 feet long. On top of the sports deck is yet another, known as the sun deck, 192 feet long, from which rise the tops of the funnel casings, ventilators and other portions of the vessel’s superstructure. B elow the promenade deck and running full length of the ship is the first of a series of decks, within the hull, lettered from A to G. The two lowest decks, F and G, do not extend the entire length of the ship, but only forward of and abaft the machinery space. The whole of the steel plating below the water line is doubled, the distances between inner and outer plates or skins varying from 4 feet at the sides to just over 5 feet in way of the centre line. Between the inner and outer plating, subdivided into forty-four main compartments, are carried oil fuel, reserves of fresh water and water ballast. The main bulk of the oil fuel for the boilers is carried in huge tanks arranged at the sides and ends of the boiler rooms. This colour plate accompanied part 27. The same illustration appeared on the cover of part 5. An interesting feature of the hull construction is the doubling of the forward water-line plating for a length of 150 feet from the stem, as a protection against floating ice. Another point of design is the use amidships of two huge beams, which provide a clear space, 60 feet long, 60 feet wide and 19 feet high, in the middle of the first-class dining saloon. The beams rest on side pillars that serve as ventilators to the machinery space. The principal dimensions of the vessel are: length overall 760 ft 6-in; moulded breadth 97 ft 6-in, and moulded depth to top of sun deck 100 ft 6-in. The load draught is 32 feet, and the gross tonnage 42,348. Although every effort has been made to reduce weight by the use of special steels, the hull is of remarkably strong construction. The flat plate keel comprises two layers of steel-plating, which together are over two inches thick. Amidships, the outer plating of the bottom and sides is just under one inch thick and extensive hydraulic riveting has been employed. Between A Deck and the promenade deck the side plating is doubled. The total weight of steel in the hull alone is over 19,000 tons. Some of the steel used takes the form of huge steel castings, such as those for the stern post, carrying the rudder, the brackets that support the propeller shafts, and part of the stem. The stern post and shaft castings, together, weigh about 130 tons. The Empress of Britain has a cruiser type of stern, but an ordinary straight stem. The stem is a rolled steel bar carried up from a casting at the forefoot. The enormous rudder and stock comprise steel forgings, weighing 65 tons, covered on either side with steel plating. The rudder forging, built up in Darlington, Co. Durham, was transported on a special sixteen-wheeled lorry to the shipyard. The journey by road took seven days and necessitated the greatest care in choice of route and handling of the load. One of the most important factors governing safety at sea is the subdivision of ships by means of watertight bulkheads. In the Empress of Britain this subdivision is effected by fourteen transverse bulkheads extending up to D Deck. The inner sides of the engine and boiler-room tanks provide additional subdivision; the after portion of G Deck constitutes a watertight covering over the respective propeller shaft tunnels. The bulkheads are pierced by large openings that can be closed by watertight doors. There are twenty-six of these doors that slide, some vertically, others horizontally, across the bulkhead openings when required. In the event of emergency all the watertight doors can be closed simultaneously from the bridge. An alarm signal at each door gives warning when it is about to be shut, and electric light indicators in the chart-room show whether the doors are closed or open. Above D Deck, where the watertight bulkheads terminate, the whole ship is subdivided by fireproof bulkheads provided with fire-resisting doors. The Empress of Britain, in addition to her fireproof bulkheads, is provided with an elaborate system of protection against fire. In all corridors and at vital points are placed chemical extinguishers for hand use. There are also numerous hydrants for the supply of water from special pumps to fire hoses. 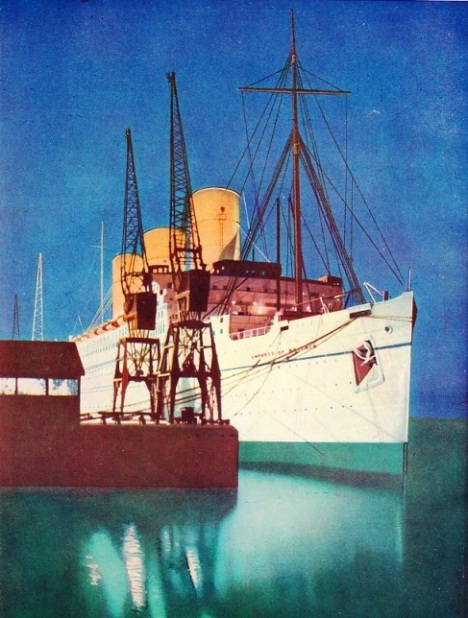 Ample warning of fire or other emergency is given to passengers and crew by a system of fifty-eight electric horns placed in suitable positions throughout the ship. 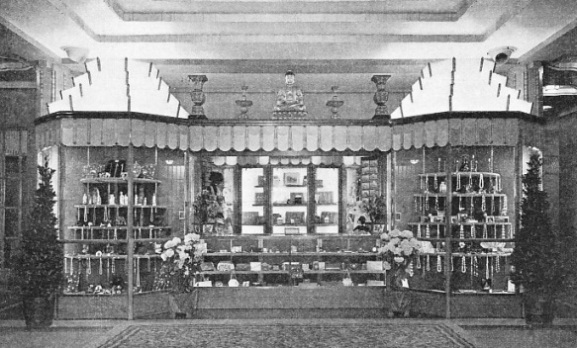 SOUVENIRS OF A VOYAGE in the Empress of Britain may be bought from a shop on the first-class lounge deck. The screened lights at either side are in keeping with the artistic lighting arrangements of the ship. In addition the cargo holds are protected against fire by means of a special smoke-detecting instrument in the wheel-house, which gives immediate indication of the -slightest traces of smoke in any of the cargo spaces. In the event of an outbreak in the cargo, the hold or holds can be flooded with carbon-dioxide gas. Similar apparatus is provided to deal with fire in the machinery rooms. A remarkable range of life-saving apparatus is carried in the Empress of Britain. Every person on board must, of course, be provided with a lifebelt. There are also large numbers of lifebuoys, some of which are of special design. When one of these is flung in the direction of a cry for help, a calcium flare attached to the buoy is ignited, which illuminates the scene at night for many yards distant. By day the column of smoke thrown up by the flare is similarly useful in aiding detection. Rafts are also available in extreme emergency for nearly 500 persons. The most important item in the life-saving equipment, however, is the fleet of large lifeboats carried under special launching davits on the boat deck. Chief among these are the eighteen large lifeboats, each 30 ft 10-in long by 10 ft wide, and with a carrying capacity of eighty-nine passengers and crew. These boats have a total capacity of 1,602 people. In addition there are six 25-ft lifeboats capable of holding a further 276 persons. All these boats are fully provisioned with food and water. In addition to this fleet there are two 30-ft motor lifeboats, each equipped with a 34 hp paraffin engine and a self-contained wireless room. The engine space and wireless room are enclosed in a steel cabin. The motor boats have a speed of eight knots, a cruising range of 100 nautical miles, and each has a capacity of forty-four. The total number of persons that can be accommodated in the emergency fleet is thus 1,966, against the ship’s complement of 1,909. Wireless at sea is used for many purposes other than life-saving. The equipment of the Empress of Britain comprises a two-kilowatt, long-wave telegraph transmitter capable of communicating with either side of the Atlantic when the ship is crossing that ocean. There are also a short-wave transmitter for long-distance work, and an emergency set operated by electric batteries. The Empress of Britain is equipped with up-to-date navigating instruments, and some of these are of special interest. The standard compasses are fitted with optical projectors which throw an enlarged image of the card on to a vertical screen, so that it can be observed readily by the helmsman. The navigation lights and the masthead lights are all electric, connected with a special electric indicator that shows whether they are satisfactorily illuminated. Should a light fail, the corresponding indicator light goes out and an electric bell warns the officer of the watch that a failure requires attention. The importance of the look-out in navigation cannot be stressed too often, and in the Empress of Britain this aspect is given the most careful attention. In the look-out post, high up in the foremast, is an indicator by means of which the look-out man can draw the attention of the officer of the watch to any object on the surrounding water. The look-out man turns the arm of the indicator in the desired direction and presses a button. An electric buzzer below then gives warning that something has been seen which ought to be scrutinized. The direction of the object is shown by a repeat-pointer which is electrically controlled from the indicator-pointer aloft. The steering-gear operating the enormous rudder is worthy of special mention, being one of the largest and most powerful in existence. The vertical column or “stock” of the rudder is equipped with a huge steel yoke, somewhat resembling the yoke of a rowing boat. Instead of the rowing boat’s steering ropes, however, there are four large cylinders opposed in pairs on either side of the rudder stock. Each cylinder contains a steel ram attached to the tiller head. Oil is pumped into the cylinders to move the rams and so turn the rudder as required. THE CONTROL CENTRE of the Empress of Britain, comprises the chart-room and the wheel-house. In the chart-room, illustrated above, is a fathometer, which automatically gives a visual indication of the depth of water below the vessel. The chart-room fittings include also telephones, the receiver of an electric log, a trim and stability indicator, and the control panel of the chronometers. The oil pumps are operated by two 160-hp electric motors controlled by the helmsman in the wheelhouse. A light touch on the helmsman’s wheel makes the great rudder swing obediently to port or starboard as required. It returns automatically to the central position when the wheel is released. The steam turbines that drive the four propellers of the Empress of Britain develop 62,500 shp and maintain a normal speed of twenty-four knots. For cruising, the two outboard propellers are removed, as sufficient speed is obtained by the use of the two inboard propellers alone. The two inboard engines develop twice the power of the outboard engines. Should an increase of speed above the normal be found necessary, an overload power is available to a maximum limit of 66,500 shp. The main turbine sets are wonderfully compact in design, despite their great size. Each comprises a low-pressure, an intermediate-pressure and a high-pressure turbine. Each turbine drives a separate pinion engaging with a main gear wheel. The inboard sets only have additional turbines for running astern. These turbines develop eighty per cent of ahead horse-power and work on both high-pressure and low-pressure steam. A description of the steam turbine’s action will be found in another part of this work. Briefly, however, a turbine consists of a drum or rotor that revolves in a cylindrical casing. To the rotor are attached vanes or blades, spoke-fashion, arranged in rings or rows. In the spaces between the rotor blades are arranged other vanes attached to the interior of the casing; their function is to guide the steam from one ring of rotor blades to the next. As the steam rushes through the turbine it imparts some of its force to the blades of the rotor and turns it round at great speed. A ship’s propeller cannot be used at rotor speed, and this is accordingly reduced by means of the gearing referred to above. Reduction is in the ratio of nine to one. The dimensions of the turbine gearing of the Empress of Britain give some indication of the immense size of her machinery. The main gear wheel of each inboard engine is 14 ft 6-in diameter, with a width across the working face of 4 ft 8-in. The outboard wheels are 11 ft 3½-in diameter, all gear teeth having been cut diagonally by special machines. The inboard screw turbines revolve at 1,365 revolutions a minute and the outboard screw engines at 1,795 revolutions a minute. Exhaust steam from the turbines is led to the condensers that form an integral part of each engine unit. The ordinary marine condenser is essentially a large bank of tubes through which sea water is pumped to cool them. Exhaust steam impinging on the tubes is condensed and used for replenishing the boilers, thus saving fresh water. Another important function of the condenser system is to reduce back pressure in the engines and so to increase power. The turbines are also fitted with special ejectors that keep them free of air. 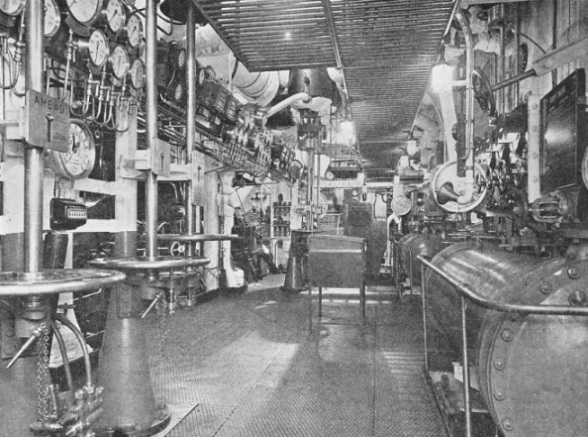 IN THE FORWARD ENGINE-ROOM of the Empress of Britain, showing the control platform. The vessel is propelled by four screws, each driven by an independent set of single-reduction geared turbines. The machinery has been designed to develop a total output of 62,500 shp to maintain a normal speed of 24 knots in North Atlantic conditions. Should, however, an increase of speed be necessary an overload power up to 66,500 shp can be obtained if weather conditions are favourable. Each inboard condenser in the Empress of Britain has a cooling surface of 20,700 sq. ft. The surface of each outboard condenser is 9,600 sq. ft. There ire some sixty tons of condenser tubes and fixing ferrules, with a total length of over sixty miles. The power of the turbines is transmitted to the propellers by four huge steel shafts, leading from the engine-room to the stern of the ship. The shafting is supported on bearings placed at intervals on supporting girders. These bearings are of the Michell type, as are also the great thrust bearings that transmit the driving force of the propellers to the hull of the ship. The Michell bearing ranks as one of the most important inventions applied to ship building. It depends for its action on the tilting of metal pads arranged between a pair of steel collars. As the pivoted pads are tilted by the revolving of the shaft, a thin film of oil is drawn in, wedge-fashion, between the moving parts and ensures perfect lubrication. Over 60,000 horsepower is thus transmitted by a film of oil less than one-thousandth part of an inch thick. The propellers are enormous and are cast in solid bronze. Each inboard propeller is 19 ft 3-in in diameter, weighs 25 tons and turns at 150 revolutions a minute. This represents a 20-ft circle turning round more than twice a second and hurling water away from it at a speed of nearly thirty miles an hour. The outboard propellers are 14 feet in diameter and turn at 200 revolutions a minute. Each propeller is so perfectly balanced that it can be rotated on a test stand by the pressure of a finger. The main steam-generating installation in the Empress of Britain comprises eight Yarrow water-tube boilers and one water-tube boiler of the Johnson type. There are also two smaller auxiliary boilers. All are fired by oil fuel, which is sprayed in under pressure and supplied with a blast of pre-heated air to ensure combustion. Working pressure is 425 lb per sq. in. (compared with the 200-250 lb of a railway locomotive), and the steam is superheated to the high temperature of 725 degrees Fahrenheit. Lead melts at 621 degrees Fahrenheit, so that the superheated steam from these boilers is a red-hot gas capable of melting lead. In another chapter a description will be found of marine boilers. The Yarrow type, however, may be briefly explained as comprising a steam drum connected to several water drums by a number of steel tubes. Drums and tubing are enclosed by a casing into which the fuel oil is sprayed and ignited. The Johnson boiler comprises an upper steam drum joined by banks of tubes to a water drum placed beneath it. Each of the Yarrow boilers in the Empress of Britain is approximately 23 feet long. 26 feet high and 26 feet wide. The operation of the oil burners is almost silent and the great sheets of white flame can be viewed through glass windows in the boiler fronts. Six of these boilers are accommodated in an after boiler-room and discharge fumes into the middle funnel. The remaining boilers are placed below the forward funnel in the forward boiler-room. The total length of boiler tubing is over 100 miles. The whole of the machinery in the ship is so arranged that not a cubic foot of space is wasted. Auxiliary machinery comprises every device for securing efficiency and economy and can be touched on only briefly in this chapter. The auxiliary machinery is in the main electrically operated, taking its current from Diesel-driven generators. Among other machines are nine 75-in electric fans for furnace air supply, oil heaters and pumps for the furnaces, oil tank transfer pumps, boiler feed and condenser pumps and other pumps and appliances for various purposes. The requirements of the Empress of Britain for electric light, heating and power are similar to those of a small town. The main generating plant comprises four Diesel-driven 450 kilowatts generators, housed in a special engine room. In addition there are two steam-driven turbo-generators of 800 kilowatts each in the forward engine-room, and a number of emergency generating sets and electric batteries. The output is direct current, which is more suitable for marine use than alternating current. 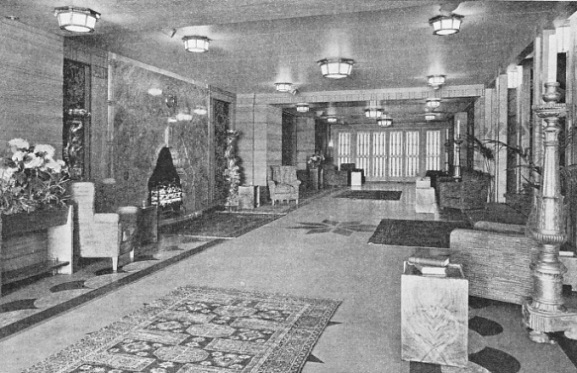 THE TASTEFUL LUXURY is the note struck by the rich appointments of the passengers’ quarters on board the Empress of Britain. The designers of the vessel made it their object to allot each passenger as much space as possible. This illustration shows an exquisitely furnished first-class entrance hail on D Deck. The ship has ten decks and accommodation for 465 first-class, 260 tourist-third-cabin-class and 470 third-class passengers. The demands on the electric supply system of this ship are heavy, for not only are the lighting, heating and cooking dependent on it, but also all the auxiliary machinery. Five passenger lifts and seven other lifts are electrically operated, as are also the winches, deck cranes, fans, laundry and various machinery. There are 407 electric motors in use for different purposes, totalling 5,720 hp. A thorough tour of the Empress of Britain constitutes much more than an afternoon’s stroll. Many hours would be needed to explore her ten decks and hundreds of passages that involve a walk of many miles. We can therefore touch but briefly on her marvels here. At the bows on A Deck there are two anchors housed in recesses let into the hull. These weigh, with a third bower anchor, over 27 tons. Aft of these is seen the cargo hatch, with its steel cover that lifts up in the manner of a huge biscuit-tin lid. The hollow steel foremast is next inspected, towering 160 feet above the promenade deck. At heights of 80 and 130 feet respectively are the look-out stations. The lower station is reached by a steel ladder inside the mast. At deck level may be seen a door in the mast with a printed intimation that passengers are not allowed inside. An external ladder links the look-out posts. Aft of the foremast and above the promenade and sun decks are the wheel-house, chart-room and navigating bridge. We then pass the forward funnel, to an open space for games, with an additional space as a children’s playground, leading to a nursery. Continuing our journey aft, either along the boat deck, or ascending to the sun deck, we pass the middle and aft tunnels and reach, on the sports deck, a full-size tennis court. The fore and aft diameter of the funnels, oval in section, is 35 feet - a serviceable size for a double-track railway tunnel. The after funnel serves as a huge ventilator to the engine-rooms, by means of a large rectangular shaft or hatchway. 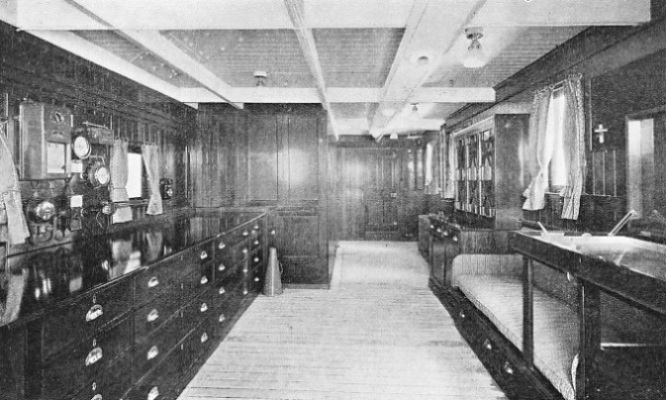 The promenade deck is enclosed for the greater part of its length, the outer sides being pierced for large rectangular windows. On either side of the ship the promenade is 18 feet wide. At the forward end is the ballroom, known as the Empress Room, designed by Sir John Lavery, R.A. It measures 40 feet fore and aft and is 70 feet wide - 2,800 square feet of perfect dance floor. Overhead is a great dome, decorated to illustrate the stars as they appeared in the sky on the night of the liner’s launch and illuminated by skilfully concealed lighting. The walls are finished in gold and silver with an underlying tone of blue. The furniture is in blue and beige. At the after end of the ballroom is a stage with coloured footlights. Adjoining the Empress Room is a cinema projection-room. The screen is situated on the ballroom stage. We now find our way aft from the Empress Room along the Mall, a magnificently decorated double gallery, leading on the starboard side through a panelled writing-room to the first-class amidships entrance for the promenade. Through either of the swing doors in the first-class entrance we find ourselves in Mayfair - the magnificent lounge by Sir Charles Allom. Still farther aft we come to the Cathay Lounge, or first-class smoking room, by Edmund Dulac. Of the remaining public rooms the most important is the Salle Jacques Cartier, or first-class dining saloon, on D Deck. This is decorated in rose and blue and is ornamented with mural paintings by Frank Brangwyn, R.A.
Of the other wonders of this ship we can only mention here the Olympian Swimming Pool on F Deck, with its adjacent Turkish baths, cafe and gymnasium. Passenger accommodation includes the extremely comfortable cabins offered the third-class passengers in the forepart of the ship, the excellent tourist-class quarters aft and the first-class luxury suites amidships. 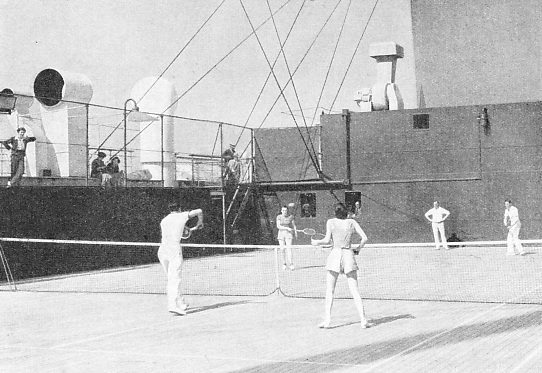 TENNIS ENTHUSIASTS travelling in the Empress of Britain have a full-sized tennis court at the after end of the sports deck. By the court are galleries for spectators and a cafe The Empress of Britain has also a swimming bath measuring 40 feet by 20 feet, gymnasium, standard-size squash-rackets court, and the usual promenade deck. IN CALM WATERS. 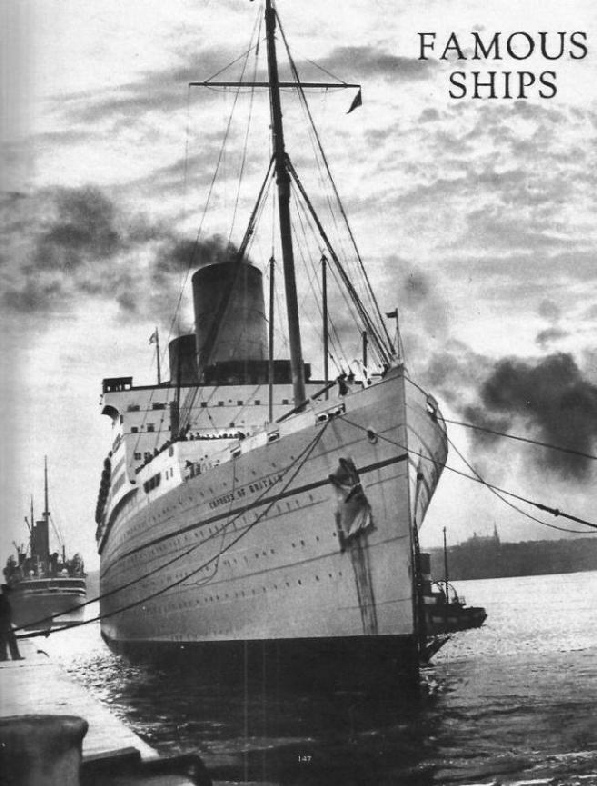 A magnificent study of the Canadian Pacific liner Empress of Britain. This fine vessel of 42,348 gross tonnage was launched by H.R.H. the Prince of Wales, on June 11, 1930. After the launch the vessel was towed to the fitting-out basin, where the completion proceeded swiftly. The vessel left the fitting-out basin in April, 1931, and the entire construction and equipment of the Empress of Britain took fewer than two and a half years. In 1934 the ship made a record voyage from Quebec to Cherbourg in four days six hours fifty-eight minutes. This illustration is taken from the photogravure supplement presented with part 5.